Boston Celtics fans love third-year SF/SG Jaylen Brown for his athleticism, his tireless work ethic, his competitive nature, and his for penchant for trying to smash on anyone's head who dare get in his way. We also love Jaylen for being as much brain as he is brawn. While most 21-year olds spend their non-working hours goofing off, Jaylen Brown spends his by speaking at universities. But not just any university -- some of the finest institutions in the country. 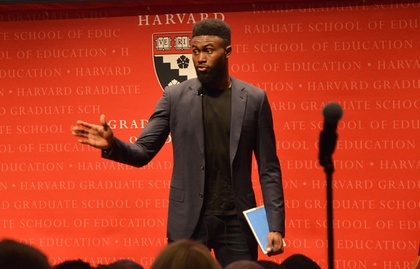 Six months ago, Jaylen was invited to speak at Harvard University. This Friday, he'll be rolling up to Cambridge, Mass. to speak at MIT (Massachusetts Institute of Technology) about innovation, basketball, social cultures, and how they all go hand in hand. Jaylen's a humble man. He's an intelligent man. He's the Celtics star-potential-having swingman. He also happens to be the epitome of a renaissance man too. Read about Jaylen's upcoming talk at MIT here.